One of my favorite stalls at the farmers market often has unusual vegetables that are not available from other vendors. They always have several varieties of eggplants and bok choy. They have baskets of chiles I have never heard of. They also have several varieties of cauliflower including the traditional snow-white head and a cheese-yellow variety they call Cheddar. This last time they had several heads of an intensely purple variety. A while back I wrote about some nearly black haricots verts that turned green when they were cooked. I wound up writing about the water soluble pigments, anthocyanins, that leech out during cooking. It seemed likely to me that the same situation existed with the cauliflower. I asked the young woman at the cash register if the purple cauliflower would turn green when it is cooked. She assured me that it would remain its same amazing color. Of course, I was skeptical so I bought a head to try. I wound up grilling the cauliflower as thick “steaks” rather than boiling it. That was really not a fair trial, but the woman was right – the cauliflower kept its vibrant color. I guess I will need to go back, buy another head, and plan a more scientific experiment using boiling water. Here’s the grilled purple cauliflower “steak” along with baked stuffed tomatoes. I got the beautiful tomatoes from another vendor at the farmers market. Together they make a nice vegetarian dinner plate. Place the slabs of cauliflower on the hot surface and grill for about 5 minutes on each side. The cauliflower should stay crisp and get a light char. Transfer the grilled cauliflower to a plate and season with salt, pepper, and a few drops of sesame oil to taste. Serve. Core the tomatoes and cut in half horizontally. Remove the seeds. With a grapefruit knife or paring knife, remove the fleshy ribs of the tomatoes and chop them finely. Set aside. In a small sauté pan, sauté the chopped mushrooms for a few minutes until completely softened. Remove from the heat. Place the tomato halves on a lightly oiled roasting pan in the middle of an oven preheated to 250°F for about 20 minutes while you are preparing and grilling the cauliflower. Serve. Recently I reported on our meal in the student center at Fort Lewis College. The highlight was tamale pie, which of course does not contain tamales at all. The original recipe comes from the era of dumping in a can of this and a can of that plus some ground beef in order to wind up with a quick dinner meal for the family. I remember tamale pie as a great favorite during my childhood, but it has gone the way of most casseroles from the 1940s and 1950s – except in school and college cafeterias, of course. The most amazing thing about the casserole was that the cornbread batter would sink into the very liquid filling and disappear, only to re-emerge magically as a crusty topping at the end of the baking time. The explanation for that is that the batter stays intact in the filling. It then becomes lighter as the baking soda goes to work and floats to the top. Akin to dumplings and bagels. You can minimize this phenomenon by making the filling so thick that the cornbread batter can’t sink. I prefer that, you can make your own choice by adding more liquid. Here is my version that I cobbled together from things in the refrigerator that needed to be eaten. It seems like I am always cleaning out the fridge. In a dry medium sauté pan over high heat, sauté the corn kernels until they are fragrant with a light char. Be careful not to burn. Remove from the heat, transfer to a small bowl, and set aside. Clean the pan and return to medium heat. Add vegetable oil and sauté the onions until translucent. Add the chorizo and peppers and cook, stirring frequently, until the chorizo is heated through and the peppers are wilted. Add the tomatoes, water, chili powder, cumin, and oregano. Simmer for 15 minutes. Then add the charred corn and black beans. Stir and continue to simmer for another 10 minutes. If the sauce is too thin for your taste, sprinkle the cornmeal over the surface, stir to completely incorporate the cornmeal and simmer an additional 10 minutes until the mixture is thickened to your liking. Adjust the seasoning with salt and pepper. In a small bowl, stir together the cornmeal, flour, salt, and baking powder. In another small bowl, combine the beaten egg, milk and vegetable oil. Remove from the oven, and let rest for 5 minutes. Divide into individual servings. Top with sour cream. Serve immediately while still warm. Fractal art has been popular for the last twenty or thirty years. It combines mathematics and art, often using computer algorithms to produce geometric patterns that are repeated at an ever smaller scale to create irregular shapes and surfaces. 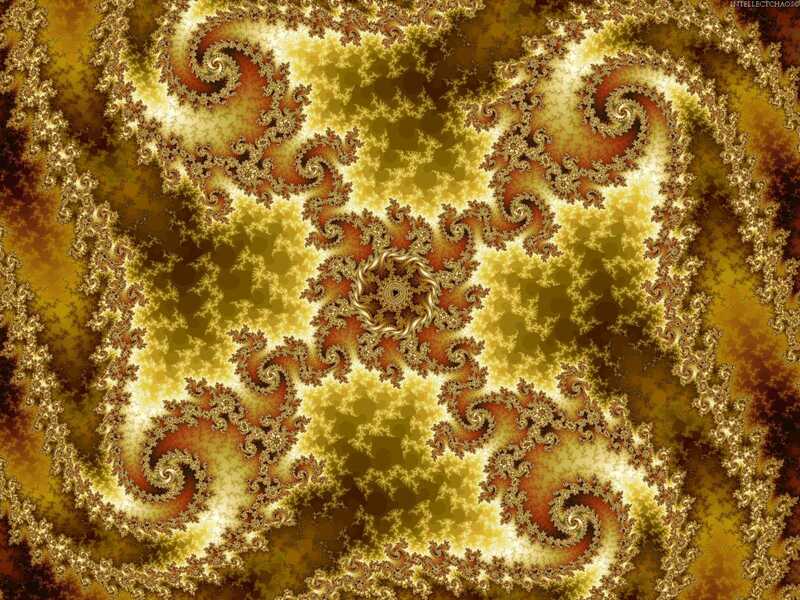 You will find some amazing fractal images on the Internet or Wikipedia. 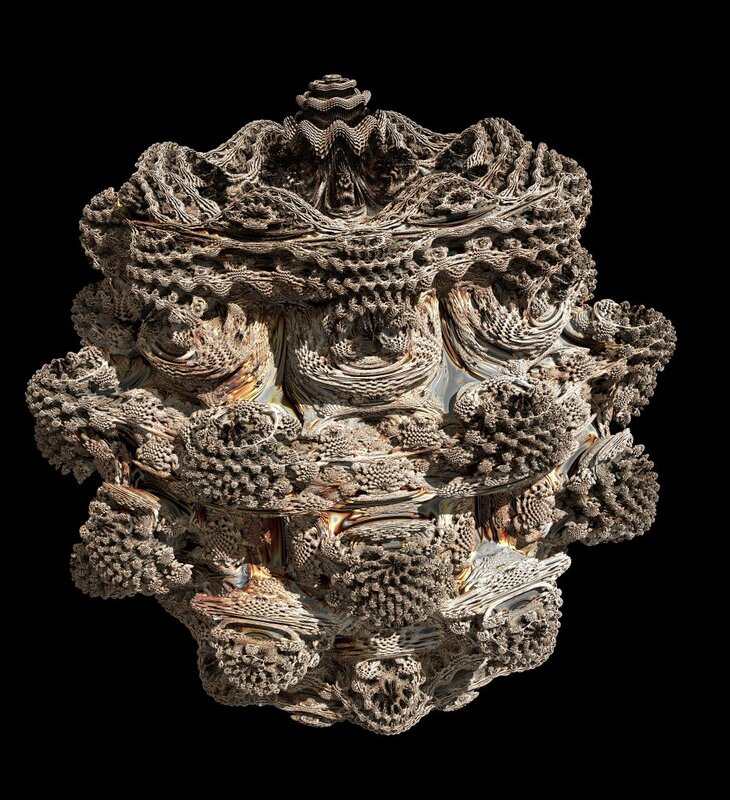 There are also some arresting examples of fractals in nature: the shape of the nautilus shell; the ever-diminishing tendrils of a lightning bolt; tree limbs dividing into smaller and smaller branches; pine cones; pineapple; and an aloe plant. A head of Romanesco is one of the most startling and beautiful. The color is almost electric, and the vegetable florets form amazing designs as they get smaller and smaller and rise into tiny pyramids. My first encounter with Romanesco was when Sarah and Evan humored me a number of years ago, letting me prep vegetables in their first pop-up dinner at Radius in San Francisco. I was fascinated by the chartreuse color, the geometrically perfect florets, and the incredible shapes in a single head. Since then, I have only seen Romanesco in a few stalls at various farmers markets. I have never seen it at the grocery store. If you should find some, select only the greenest heads and plan to use them in a day or two. Use the vegetable in your favorite recipe for broccoli or cauliflower. Or be adventurous and try something different. They’re even delicious raw. There is a certain mystery about the vegetable. Some call it Romanesco broccoli. Some call it Romanesco cauliflower. That’s because no one seems to be quite certain what its closest relative might be. The cautious – like me – just refer to it as Romanesco. What does seem clear is that it was first developed in Rome at least as early as the 16th century and hence the name. The great thing is that you can use it as you would either broccoli or cauliflower. You can also have a good time admiring its unique and beautiful shape. This recipe is an adaptation from one found in the lavishly illustrated, encyclopedic Vegetables from Amaranth to Zucchini by Elizabeth Schneider (HarperCollins Publishers Inc., New York, 2001, p. 124) Somehow, Romanesco, pine nuts, garlic, and Romano all seem to go together. I have browned the garlic in the brown butter. “Whoa,” you say. “Browned garlic is bitter.” But that’s not true if you make sure it doesn’t burn. Think of that delicious Mexican garlic and butter sauce, mojo de ajo. Add some grilled ham and you have a set of complementary flavors and a complete light dinner. In a dry sauté pan over medium heat, toast the pine nuts until lightly browned and the oils have been released. Stir frequently. Do not burn. Remove from the heat and set aside. In a large pot fitted with a steaming rack, place the whole head of Romanesco over about an inch of boiling water and steam, covered, for 10 minutes or until the vegetable pierces easily with a cooking fork. Season with salt and pepper. While the Romanesco is steaming, melt the butter in a small sauce pan over medium-low heat, stirring frequently until the butter solids begin to brown. Be very careful not to burn. Stir in the minced garlic. The mixture may foam up. If that happens, stir vigorously and remove from the heat until the foaming subsides. Return to the heat only until the garlic is lightly browned. Grill a small boneless ham steak and arrange in the middle of the serving plate. Place the steamed Romanesco on the grilled ham steak. Sprinkle with the toasted pine nuts. Pour over the browned butter with lightly browned garlic. Top with grated Romano. Serve whole and cut into servings at the table. For the past few days we have been in Durango, Colorado for the annual meeting of the New Mexico Native Plant Society. That sounds strange, doesn’t it? The story goes that nearby Farmington, New Mexico sits in the desert and oil patch of northwest New Mexico with limited native plants. Durango feels isolated from the rest of the Colorado Native Plant Society but has an abundance of native plants. The two cities decided to merge their membership in New Mexico. On top of that, Durango lies at the base of the San Juan Mountains, arguably the most beautiful range of the Colorado Rockies. The mountains are filled with old-growth forests, spectacular wild flowers, and stunning trails. Besides, Durango is a quaint gold and silver mining town from the 1880s with a lot of beautiful Victorian buildings. It is the center for river trips down the Animas River, hub for mountain bikers, and the terminus of the famous Durango and Silverton Rail Road, a vintage narrow-gauge train that takes passengers on a scenic trip through the San Juans to another old mining town, Silverton. With all of that going on, it was not surprising that the meeting sold out well in advance. At these annual gatherings, Susan always goes to the meetings and field trips. I never do either one. I usually strike out on my own for a private photo shoot. This year was no different except that I didn’t wander that far afield. Because of a crash of my Adobe Lightroom software, I wound up having to post some images from my iPad and iPhone. Apologies for the quality. The first night we ate at the Mahogany Grille of the Strater Hotel. This landmark was built in 1887 and has been lovingly and beautifully preserved. We were looking forward to our experience, because the restaurant promised fine dining in an antique setting. We were not disappointed with the room, but the dining did not really fulfill the concept of fine dining. For starters, the place was jammed with tourists in short shorts, cut-offs, and flip-flops. Durango is a classic summer tourist town overwhelmed by huge extended families of all ages, sizes, dress, and demeanor. Caesar salad. Note the house made croutons and the egg yolk without the green rim of shame. The host sat us at a very private booth in the back of the room, so that took care of the crowds problem. The menu sounded very interesting with bruschetta and various toppings, elk chops, lots of grilled meats, corn chowder and what sounded like tasty salads. The kitchen gave it a good effort, but my glazed salmon came out dry and a little burned on the bottom, and Susan’s Colorado trout (That should be local and straightforward) came out so dry that Susan had to ask for some melted butter as a sort of sauce. All in all, a bit of a disappointment, but still a pleasant experience in a great old hotel. The next night was another story. We were staying in the student apartments at Fort Lewis College, located on a mesa top with the San Juans as a backdrop. A lovely, if Spartan, setting. Because of the long day of walking behind us, we decided to try the college’s “All You Can Eat Buffet” at the student center. The choices included the mashed potato bar with cheese, sour cream and bacon bits, the salad bar, pizza, and the night’s special: tamale pie with grilled chicken. I had forgotten what dorm food can taste like. This brought back memories of my youth. We did not go back for seconds. In fact, we didn’t finish firsts. But the high school and college students who were participating in summer programs seemed to love it. Of course, their favorite was the pizza. Here are a few of my food images from our two dining-out experiences as well as some shots from my trip along the route of the D&SRR and the San Juan Mountains. It is definitely the time of year to make ice cream at home. It always tastes so much better than what you buy at the store, and these days it is easy to make. When I was a child, in the hot summer we often sat out on the back porch with the ice cream churn, a burlap sack of ice, and a big box of rock salt. My mother would set a tinned canister filled with a sweet cream mixture in the middle of the wooden churn bucket, and my father would pack it with ice and rock salt in layers so that the melting ice would stay as cold as possible. Then the kids took turns turning the crank so that the dasher inside the canister would scrape the cream as it froze against the side. The process seemed to take a long time, and no single kid could finish the whole effort. At the end, some grown-up – usually my father – would turn the crank until it wouldn’t turn any more. The dasher came out. The kids took turns licking it, and the ice cream was put back into the ice to firm up a bit before everyone got their own bowlful of the ambrosia. Next in the evolution of the home ice cream maker was one with an electric motor. Ours never survived very long, because the motor would burn out when everyone forgot to watch it carefully. Now, there are all sorts of choices and all sorts of prices. We have had our machine for many years, and it continues to work just fine. One advantage is that we can make ice cream whenever we want it. We don’t have to wait for summer. We stick the canister in the bottom of our freezer and forget about it until it is time to make a batch. Then we fill it up, put the dasher in, fasten down the cover, and turn on the motor. In about half an hour, we have ice cream that tastes better than anything one can buy. Our machine cost about $50 when we bought it. It’s probably a little more expensive these days, but not much. You can buy versions with built-in freezers and elaborate adjustments. Those can easily run to well over $300. In my view, you have to eat a lot of ice cream to justify the expense, but someone must be buying those machines. This recipe comes from our family cookbook. It is called French vanilla ice cream. I always thought “French” referred to some kind of fancy vanilla, but it turns out that “French” implies that the ice cream is made from custard. That makes me think that the proper name for the dish should be vanilla French ice cream. I don’t look for that change to occur. Crème anglaise is probably the most common custard base used for ice cream. This recipe is actually based on a modified crème anglaise that uses whole eggs instead of egg yolks. But the same warning applies: don’t let the custard get too hot or the eggs will scramble. Even if you don’t do that, you should always strain the custard before you chill it overnight as invariably there will be tiny little clumps of egg, and you want the finished ice cream to be as smooth as possible. Place the mixture in a heavy-bottomed saucepan over medium low heat. Stir constantly until the mixture has thickened and coats the spoon. It should reach about 160°F. Do not boil or the eggs will scramble and you will have to start over. Remove from the heat and cool for about 5 minutes. Stir in the cream and vanilla. Strain through a fine-meshed sieve into a storage container and refrigerate, covered, over night. Place the mixture in an ice cream maker and spin according to directions. Transfer the finished ice cream to a container and place in the freezer for an hour to temper. Serve. Yesterday I received a notice that I had just completed four years of blogging. That includes 276 posts. Honestly, I had never planned to go on that long, and I didn’t think that I would come up with that many things and recipes to write about. I’ve been averaging about one and a third posts per week. For many of my blogging friends that’s not many, but for me it takes a lot of effort. This blog just started out as a way to communicate with my family and a few friends, but it has evolved into a lot more. I have made friends around the world who share an interest in food and photography. I have learned a lot about cooking and cameras, and I continue to be amazed at the wonderful recipes and images that the many talented bloggers produce. Thanks to my followers. I enjoy your comments. Thanks to those I follow; I have enjoyed your insights. Thanks to those who just look in. You have helped sustain my enthusiasm. When two of our kids were in school at the University of Texas at Austin, we would often visit. At least part of each visit inevitably was spent at a restaurant, Mom and Dad paying of course. A favorite place was the Hyde Park Café. It was fairly close to the campus, and the food was very good. It was a little pricey for college budgets so we often went there when we were in town. The rest of the time, Peter and Sarah would usually eat ramen in their house lovingly called Casa Hillmont, or they would choose takeout offered up at the “roach coach” on the street corner just outside the physics building. The Hyde Park is still very much a part of the Austin food scene, although it has changed its name to the little more upscale Hyde Park Bar and Grill, and they have opened another location in another part of town. Whenever we ate there, Susan always got the peach pudding for dessert: a square of warm cake topped with peaches and swimming in a pool of thick cream. It is still on the menu at Hyde Park. Somewhere along the way, we managed to get a copy of the recipe and it wound up in the family cookbook. It’s still as good as ever, and it makes a great dessert for company or for pot-luck dinners. You can dress it up with whipped cream or crème fraîche or ice cream, but I think it is best warm with thick cream. Thaw and drain the peaches. If you prefer, you can use fully ripe fresh peaches. It will take about four large peaches. Blanch and peel them, cut them into slices and toss with sugar and Fruit Fresh or citric acid the night before. Refrigerate until you are ready to use them. Using a stand mixer, beat the butter until smooth. Then cream together with the sugar, beating until light and fluffy. Add the eggs one at a time, beating after each addition until the eggs are fully incorporated. Add the vanilla and beat until fully combined. Sift together the flour, baking powder, and baking soda. Add the dry ingredients to the batter, one-fourth at a time and alternating with the buttermilk. Beat well after each addition. Continue beating until smooth. Pour the batter into a greased 9 x 12 inch metal baking pan. and arrange the peaches evenly on top. Note: The batter will rise and overflow a smaller pan, and baking will be greatly prolonged in a glass pan. Bake in the middle of a preheated oven at 350°F for 25 minutes. Turn the pan around and bake for an additional 25 minutes. Check frequently during the last 15 minutes of burning as the topping burns easily. If it becomes too brown, cover loosely with aluminum foil. When done and the center has set, remove from the oven and let cool for 10 minutes. Cut into serving-sized squares and serve while still warm with heavy cream, whipped cream, crème fraîche, or ice cream.